Crispy, salted pretzel sticks in two individually sealed freshness packs. 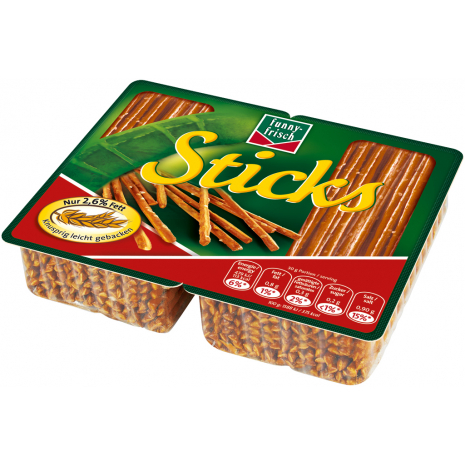 Baked in a particularly gentle manner, the salted funny-frisch pretzel sticks are ideal for a sociable evening. And in the two individually sealed units, they keep the crispy taste fresh for a long time. Suitable for vegetarians. Protect from direct sun light and humidity. WHEAT FLOUR, salt, palm oil, yeast, sugar, WHEAT MALT, acidity regulator (sodium hydroxide). WEIZENMEHL, Salz, Palmöl, Hefe, Zucker, WEIZENMALZ, Säureregulator (Natriumhydroxid).